The annual registration fee of $100 per child is due upon enrollment and for each year thereafter. This registration fee is non-refundable. Parents are responsible for payment for each week their child is enrolled, whether the child is in attendance or not. In the event you must permanently disenroll your child(ren), we require a two-week notice to The Willow office. If your child must be temporarily disenrolled due to a long-term illness or other extenuating circumstances that extend to a month or longer, you will not be charged weekly fees. For approval of temporary disenrollment, please see Director, Kristen Beasley. 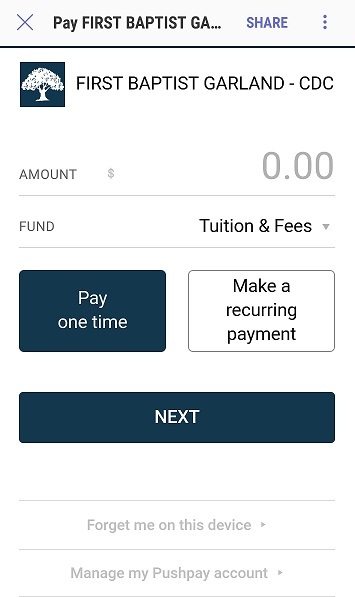 Tuition payment is to be made by cash, check, text-giving, or online by clicking here. You can make payments online or via your mobile device. Both text-giving and online payments can be done securely via our payment processor, PushPay. If payment is to be made by cash or check, please deliver to The Willow office. On your cell phone text GARLANDCDC to 77977. Note: Make sure to text in all caps and we no longer require the amount in the initial text format. You will now be presented with a payment window. Please refer to the remaining steps. A payment link will immediately be texted back to you from PushPay for you to register and allow you the ability to manage your account by downloading the PushPay app. NOTE: This is a one-time setup requirement. NOTE: For future transactions, you may continue to text GARLANDCDC to 77977 and enter your payments on the payment window as shown above or make payments by downloading the PushPay app.